When my boy turned six months old we decided that he was old enough to make the big trip to the west coast of the USA for a visit with my family. Life a good Frenchwoman, I utilised the healthcare services before leaving: I took my boy to the doctor to confirm everything was okay, particularly the ears, I have problems with my ears, too; got a few ‘in case’ prescriptions, then went to the chemist and bought saline solution for the boy’s nose, Doliprane for any pain or fever, cortisone cream for any skin irritations, and his regular creams and soaps. Luckily, my husband went to the US with me. I could not have done this trip alone. Before boarding the plane in Geneva, we cleared the boy’s nose and gave him Paracetimal to help him relax. When the plane descended, I nursed him to help prevent pain in his ears from altitude pressure changes. It was the long-haul flight out of London that was rough. 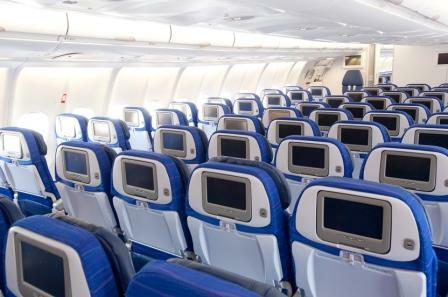 In the first instance, the airline provides either a cot or a little seat for the baby to have on take off and landing. Our boy was too big for the cot and the seat made him sit up and therefore not get comfortable for sleep. All around us babies and toddlers slept, but not our boy. By the end of ten hours, he was fussy and folks on the airplane kept giving us dirty looks as though we were pinching him. By the 12th hour of flying, I was about ready to pull my hair out. Shortly after arriving in the US and settling into my family home, the boy came down with a fever. He was listless, hot, and clung to me as a baby monkey clings to its mother. We decided to visit a doctor and were only able to see a paediatrician because my nephew has been going to him for ten years and recommended us to him (really). The doctor told us that our boy had had an ear infection before the flight (? ), which had worsened during the flight, now necessitating a ten-day round of antibiotics. We followed his instructions. Ten days later, my boy was not much better and we only had another few days before making the flight back to France. Should we cancel? We booked another appointment with the paediatrician who advised that he be given a strong dose of antibiotics shot into each of his little thighs. The hardest thing for me was that I had gone to the doctor’s office without my mother and without my husband The doctor told me that, as the next level of antibiotic, an injected antibiotic, would be very strong, it would be best if I stayed at his office under supervision for an hour to make sure that there is not an epileptic fit, seizure, or heart attack (?!). I was terrified. I desperately tried to call my husband at my mother’s to consult him, but he was not picking up. I then tried to get my mother’s attention in the car outside where she sat waiting for us to leave, in order to get some advice and encouragement, but the doors to the clinic were closed and she did not see or hear me. I made the decision alone to do it. The two nurses came into the room while he was laying calmly on his back with his little legs in the air. They put on blue plastic gloves and held up the shots. At this moment, he realised something was wrong. They simultaneously gave him the injections in each of his little thighs and he began screaming. Afterwards, I took him to my breast in order to nurse him and calm him down. It was the very first time he bit me, which hurt and caused me to cry out, but I figured it was fair. I sat worried and alone with my little person that whole hour, wondering whether I’d done the right thing. Worried that his body would reject it. Worried that his ears would not be better for the flight back and he’d be in so much pain or he’d go deaf. The flight back was gruesome. He did not sleep, and I was in a chair that had a broken armrest and video. But we got back to France. My boy did not go deaf. The infection was cured. The French doctors told me that it was best to have given him the injections, that it was not the Americans’ being overzealous about the administration of antibiotics. It will be a year before I make that trip again.